FLORIDA (KFSN) -- A Florida man is accused of rigging the front door of a home in an attempt to electrocute his estranged pregnant wife. The Flagler County Sheriff's say in a Facebook post Friday, their deputies responded to 110 White Hall Drive in Palm Coast on December 26 to conduct a security check of the property after the homeowner contacted authorities about suspicious statements made by his son-in-law regarding not letting a child touch the front door of the home. Once on scene, deputies observed that the front door appeared to be barricaded and there were burn marks near the door handle. A deputy kicked the door and upon doing so, a large spark was observed. 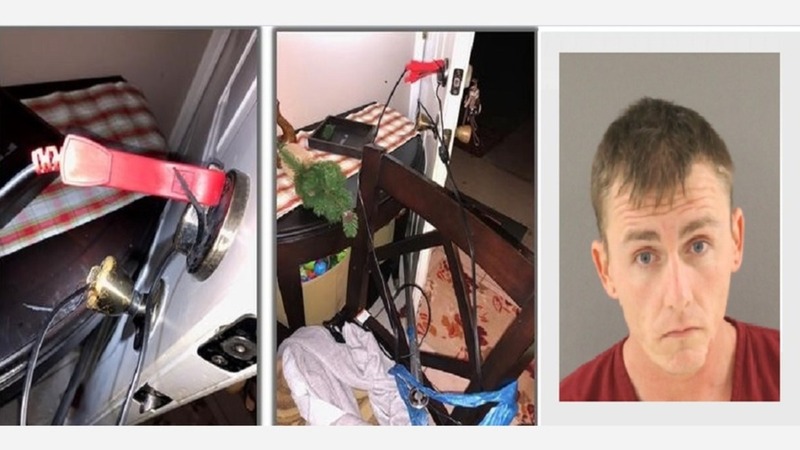 Based on observations made by the deputies on scene, it was apparent that the suspect rigged electrical devices to the top door lock and lower door handle in an attempt to electrocute and cause serious bodily injury or even death to whomever attempted to unlock and open the front door of the residence. A thorough investigation found that Michael Scott Wilson, 32, rigged the door in an attempt to cause great bodily harm to his estranged wife. He also stole a firearm belonging to his wife's father from the house. A warrant was signed for Wilson's arrest and he was located in Knoxville, Tennessee, around 12:30 p.m. on Thursday and taken into custody. Wilson is charged with two counts of attempted aggravated battery on a pregnant person and one count of grand theft of a firearm. He is being held on a $150,000.00 bond and will be extradited to the Flagler County Detention Facility to face charges. "This is one of the most bizarre domestic violence cases I have seen in my career," said Sheriff Rick Staly. "Not only did this man plan to electrocute his wife, but he could have injured a deputy or any person attempting to enter this residence. Thankfully this man was found and taken into custody before he could cause the harm he intended." This is an ongoing investigation and additional charges are pending.